For the past few years, tantalizing evidence has been found that Mars — thought to be long dead, dry, and lifeless — may have pockets of water just beneath the surface. To be clear, we know there’s water on Mars, in the form of ice. We see ice in the polar caps, and we’ve seen it revealed under the surface by small meteorite impacts. The question is, is there liquid water? The picture above shows Newton’s crater wall. It’s pretty steep, with about a 35° slope, and the dark deposits are labeled. This crater is located in the southern mid-latitudes of Mars, and this part of the crater faces north. That’s critical! Since it faces toward the equator, that means it’s facing the Sun in the summer, and so these deposits appear when the temperatures get warm. NASA has created several animated gifs (too big to embed here) that show the growth and retreat of these features over time. You can easily see how these dark features change. In the past, similar things have been seen in gullies on Mars. It’s not clear those are from water, since frozen carbon dioxide can also be thawing out and forming them. 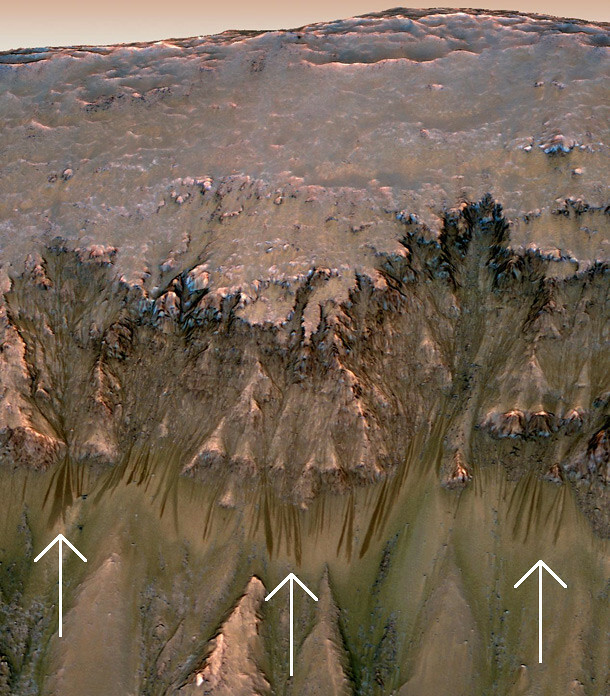 In those cases, the flows were seen on the cold-facing sides of crater walls, making it less likely they’re from water. These new formations are on the warm-facing side, making it more likely they are from water. So what’s going on? It’s not precisely clear. MRO cannot confirm that these flows are from water. What we need (barring direct samples from the ground there!) are spectra — that is, breaking the light up into separate colors, allowing the composition of the material to be determined. It’s like taking a fingerprint or a DNA sample, except with light. Unfortunately the spectroscope on board MRO isn’t capable of seeing these flows well enough to tell us what they’re made of. But the evidence is compelling. The idea that previously seen flows are CO2 cannot be discounted, but having these new flows associated with warmer temperatures is a big step in the direction of water. If it is H20, it may be salty, and not pure — there’s pretty conclusive evidence that salty water existed on Mars ages ago, and there are lots of salts left on the surface today. That’s actually interesting: salty water freezes at a lower temperature, so can be liquid in colder environments. If this is water — and really, no matter what it is — questions remain: why are these only in mid-latitudes, and not nearer the equator? Are the dark deposits actual mineral deposits, or transient water-stains (like towels and dirt getting darker when wet)? Is this material that’s flowing liquid or solid deeper underground? How big are the reservoirs of this material underground? And of course, The Big Questions: do these features support life? Could the Red Planet only be mostly dead? These new observations do not answer that, but again they’re taking us in the right direction. In November 2011 NASA will launch the Mars Science Lab, aka Curiosity, a golf-cart sized rover that will roam the surface with the specific goal of looking into whether Mars is capable of hosting extant life. It won’t be anywhere near Newton crater (and the walls are too steep for a rover anyway), but if Mars is still hospitable — for microbes, that is, if not us — Curiosity has a really good shot at letting us know. – Are Martian gullies formed by water or not? – Is NASA hiding life on Mars? I seriously doubt it.